Setting rules reduces the risk of harm to our children. We take action daily to protect them from injury, such as using car seats in the car, locking away medication, gating off stairways, etc. and these simple practices become the framework that helps to keep our children safe. According to the Centers for Disease Control & Prevention, behind vehicle accidents, fatal drowning is the 2nd leading cause of unintentional injury-related death for the 1-14 year olds. This alarming statistic highlights the essential need to implement and to follow a firm set of protocols and rules for the swimming pool. Drowning is preventable, and incidents can be decreased with more awareness. Follow the simple ABC’s of Pool Safety to help to keep your children safe in and around swimming pools. It is important to be familiar with the degree of child supervision that is needed at each developmental stage. Although risk diminishes with age, it is important to note that one can never be too vigilant. Children must always be supervised in the pool and be in your direct line of vision. Ultimately, you have to see them to be able to save them. Much of a toddler’s charm comes from their unpredictability, and it is because of this behavior that they require the utmost care and supervision. Any body of water should be heavily restricted, and a toddler should always be within arm’s reach. As your child grows, introduce and enforce rules concerning the pool and swimming. Whether, at home or friends, children should not be allowed to venture in or even near the pool without proper adult supervision – tell your children always to seek permission to swim. Encourage them to share your pool rules and the ABC’s of Pool Safety with friends that may not have been brought up in an environment where water safety has been necessary. Teens can put themselves at risk with reckless behavior leading to some unsafe situations in and around the water. Teach your teen always to use the buddy system and never swim alone. Information saves lives; discuss with your teen the effects of drinking and drugs on their swimming ability, hypoxic blackout and the dangers of shallow water diving. Talk about rip tides, currents, and cold water. Safety experts all agree that while multiple layers of barrier protection are needed around a swimming pool it should be stressed that pool barriers in no way replace competent adult supervision. 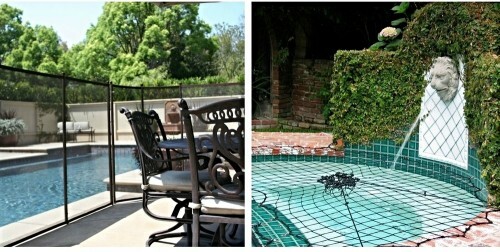 The two most recognized barriers commonly used to secure swimming pools are Pool Fences and Pool Safety Covers. There are a wide variety of these products on the market today, but one assurance of quality is ASTM compliance, indicated by the presence of ASTM labels. Originated in 1898 by a group of railway engineers to deal with issues concerning their steel rails, ASTM International has become one of the largest classification and standards developers in the world. ASTM pool barrier standards are referenced and recognized by most federal and state pool barrier mandated codes and statutes. It is important to note that ASTM performs no part in approving, certifying or enforcing compliance with its standards, so be wary of companies making such claims. • The access gate opens away from the swimming pool. • There will be a clear zone of at least 20 inches between the barrier and swimming pool. • The gate is self-closing and self-latching and the latch is placed no lower than 54-inches above the ground. The gate is hinged, and the latch is placed on the outside of the gate. • The fence height on both sides of the grade will be above 48 inches. • The vertical clearance from the grade to the enclosure bottom will not exceed 1 inch. • Gaps and Voids within the fence will not allow passage of a sphere equal or greater to 4 inches. • The fence surface will be free of protrusions, cavities and other characteristics that would serve as a handhold or foothold. The distance between the vertical poles is sufficient to hinder a child’s ability to climb. • The static load test for weight support. The cover should be able to hold a weight of at least 485lbs (the estimated average weight of 2 adults and one child) to permit rescue operation. 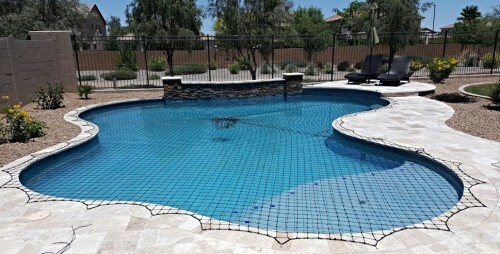 • Perimeter Deflection Tests for entry or entrapment between the cover and the side of the pool. The cover must demonstrate that any opening is sufficiently small and strong enough to prevent the test object being passed through. • The Surface Drainage Test that safeguards against a dangerous amount of water collecting on the cover’s surface. • Labeling requirements must include basic consumer information such as the warranty information, the appropriate warnings as described in the standard and acknowledge the product as a safety cover. It is important to note that all barriers must be correctly installed, removed and replaced. It may seem obvious, but actually use the product that you’ve bought! Make sure you have a rigorous routine of checking that the gate is securely locked, and the cover is properly in place. Product upkeep is just as important as use. Pool Cover and Pool Fence owners should regularly check their product for wear and tear. Remember pool barriers should not be solely relied upon as a method of drowning prevention – you can never be too careful when lives are in the balance. It is important to get your children familiar with swimming and pool safety from a young age. 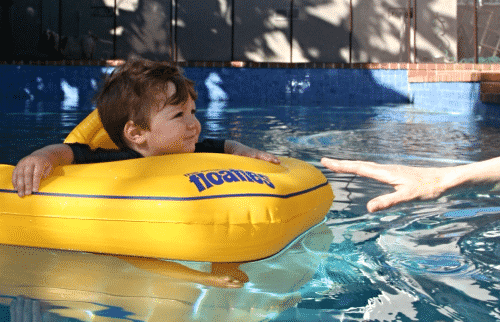 Leading children’s organizations such as The American Society for Pediatrics’s and Safe Kids all recommend swimming classes as soon as a child is developmentally ready. Having your children take regular swim classes will make them more comfortable in the water and decrease their chances of experiencing an accident. An added benefit of swim classes is that they will diminish your children’s fascination with the pool as they get more used to experiencing it in a safe environment. Your children aren’t the only ones that should be taking classes! 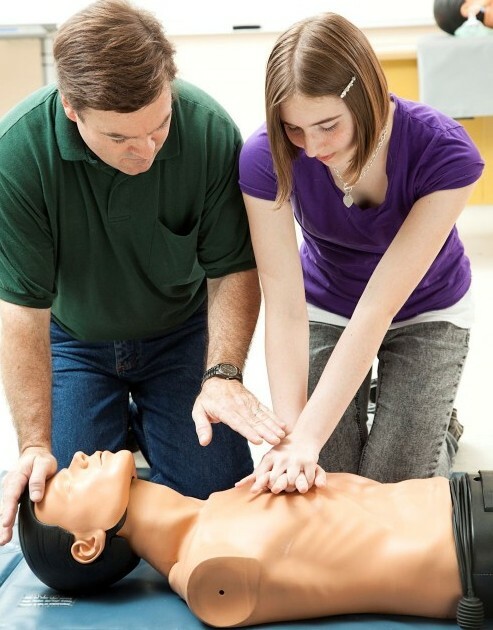 Parents should take an active role in drowning prevention and enroll in CPR classes. This 1-day commitment SAVES LIVES – enabling parents to deal swiftly and effectively with an accident that has already happened. Every year countless lives are saved by CPR.